.fail is an internet domain that is specifically geared for .fail is an internet domain that is specifically geared for people who are into making and posting funny content for the general audience. It is also useful for showcasing failure stories of poor products/services and business houses. Who should get .fail ? People with an interest in creating and publishing funny content (with a sarcastic twist). People who are experts in reviewing products/services, business houses, workplace practices, national policies, etc., but those specifically which have failed to serve their purpose, with an ultimate objective of driving change and highlighting how we can learn from each other’s mistakes. 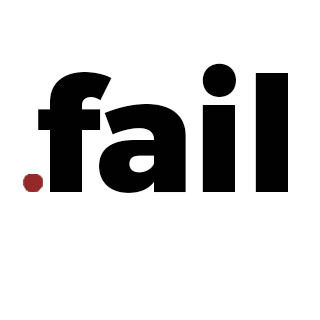 Using this .fail domain extension increases traffic to your website and makes you and your business popular. .fail is an internet domain that is specifically geared for people who are into making and posting funny content for the general audience. It is also useful for showcasing failure stories of poor products/services and business houses. Using this .fail domain extension increases traffic to your website and makes your business popular. For .fail WebEngin is the Certified and #1 domain registerer maintaining standards and providing best price on all domain types.